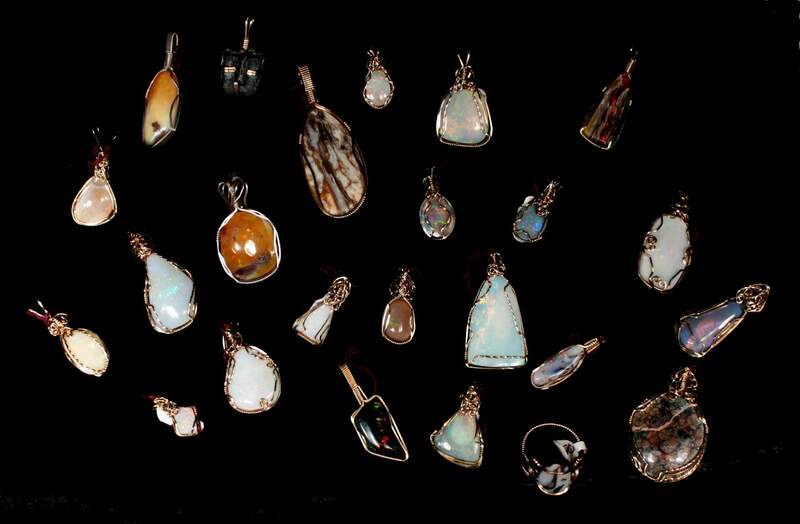 Pictured: Julie Wilson and a spectacular collection of arrowheads collected by her ancestors Harry L and Mabel Wilson in the late 19th and early 20th century (today, arrowhead collecting is illegal!). The Royal Peacock is the only opal mine in the Virgin Valley offering a full-service gift shop. In addition to cool drinks, snacks, and sundries, we sell tools, firewood, and other basic supplies. 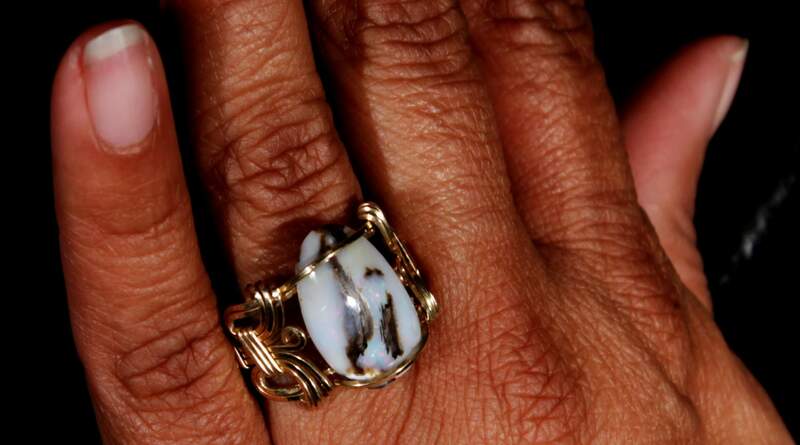 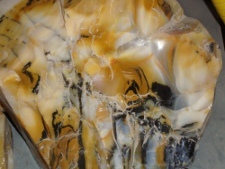 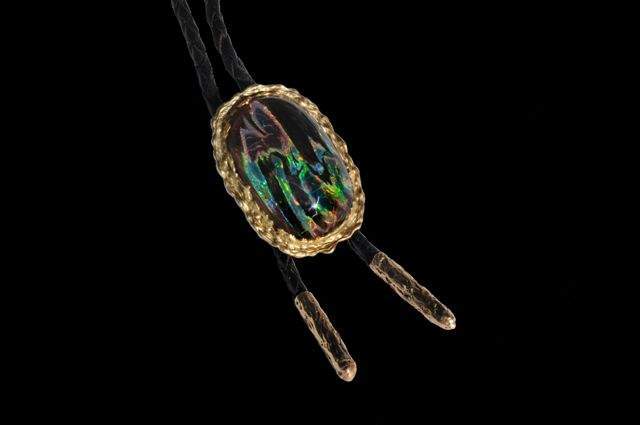 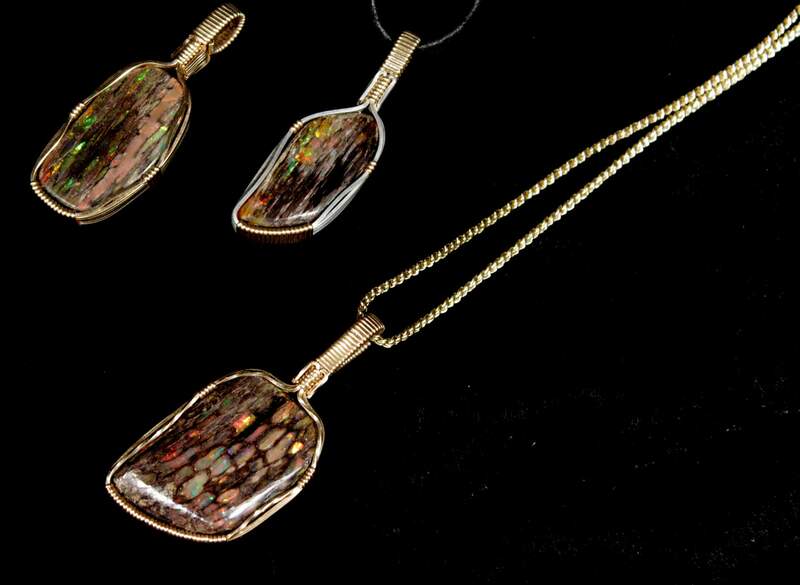 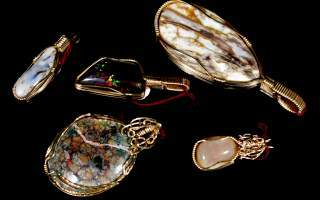 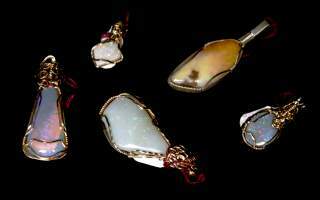 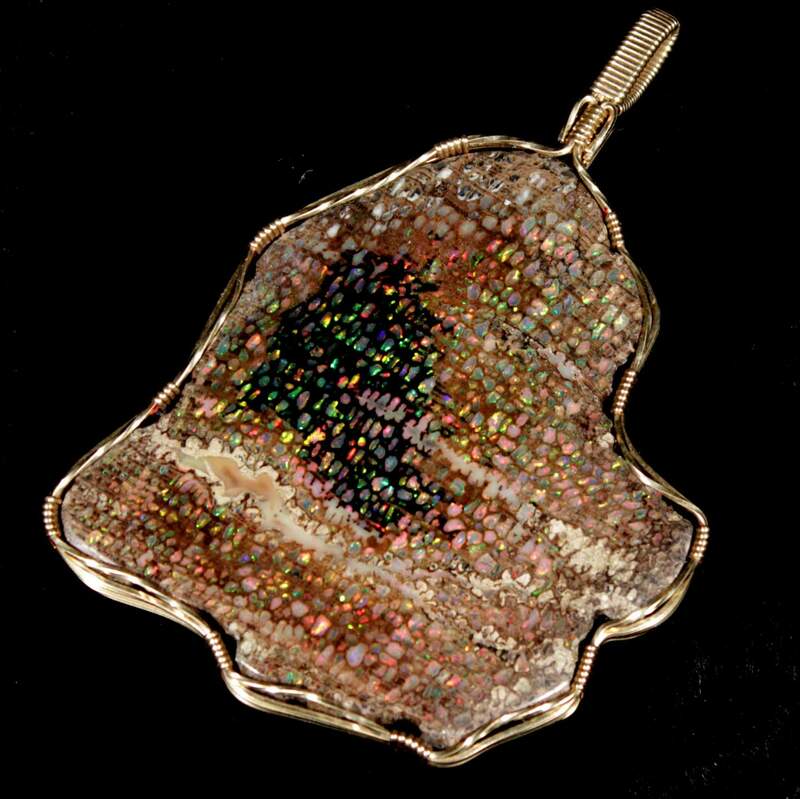 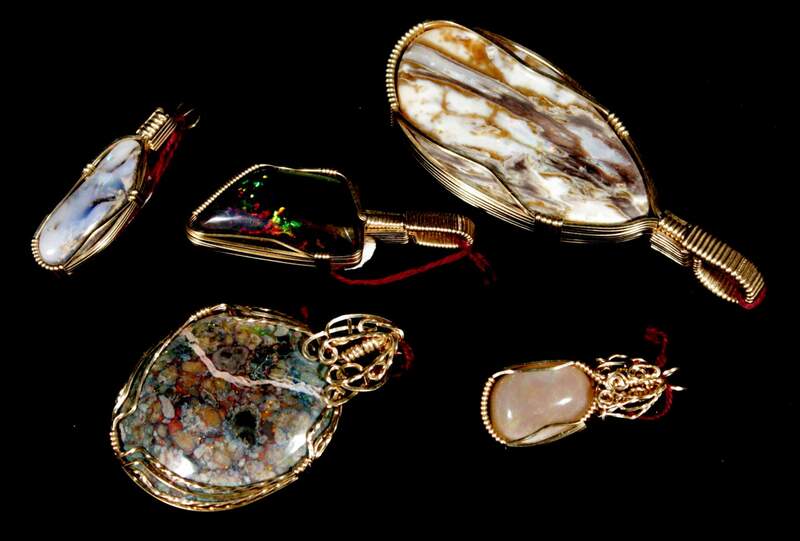 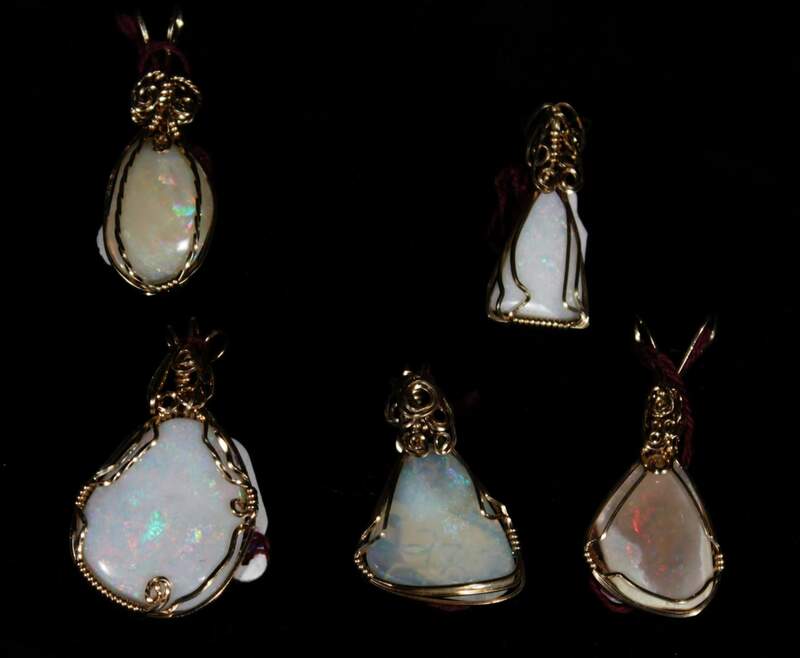 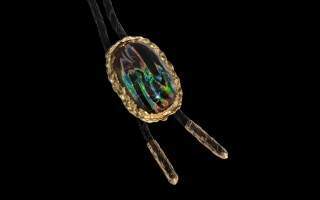 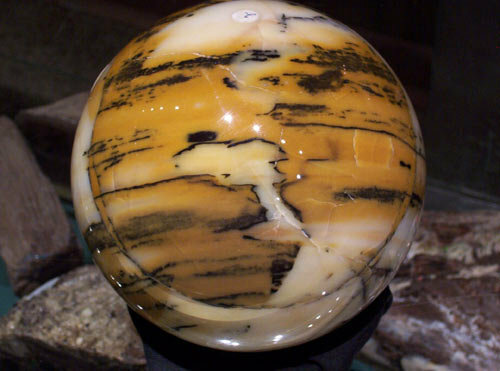 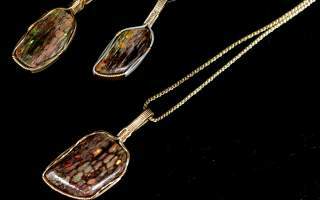 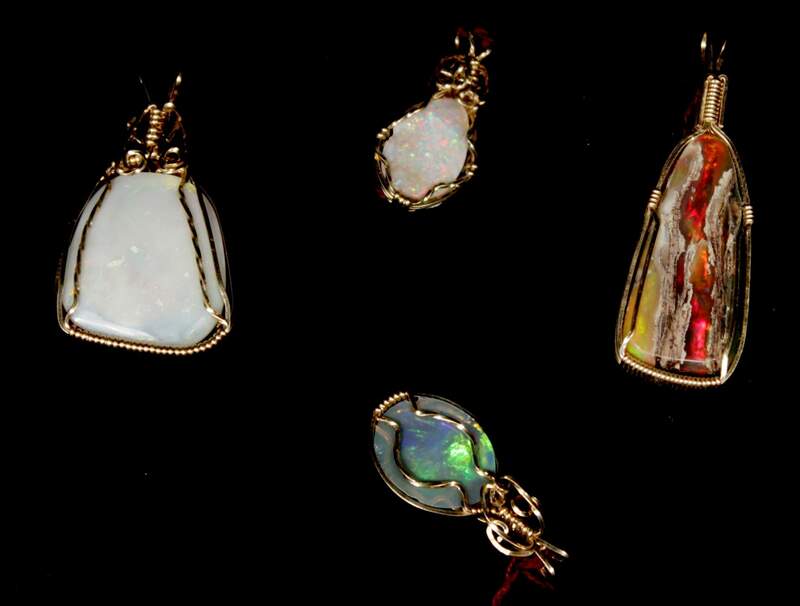 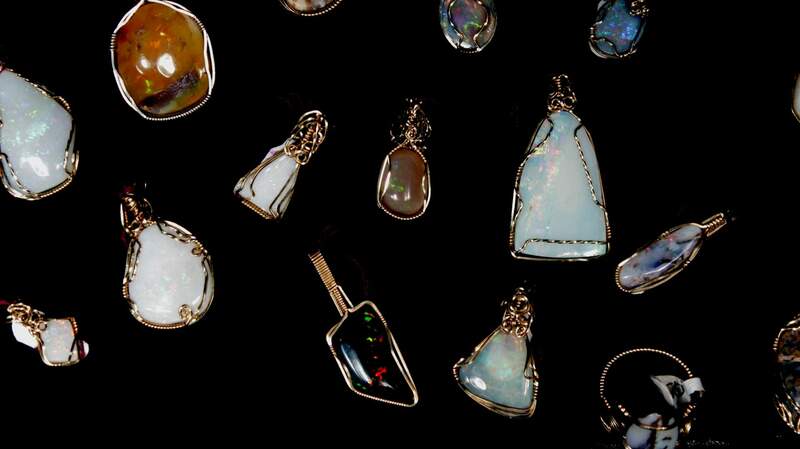 The shop also offers a wide assortment of opals, jewelry, and other collectibles. 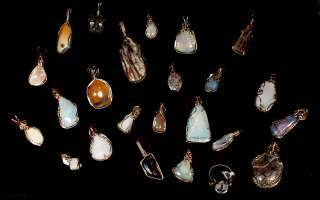 The shop also serves as the office; please check in here first if you wish to mine for opals, set up camp, or rent an RV space or cabin. 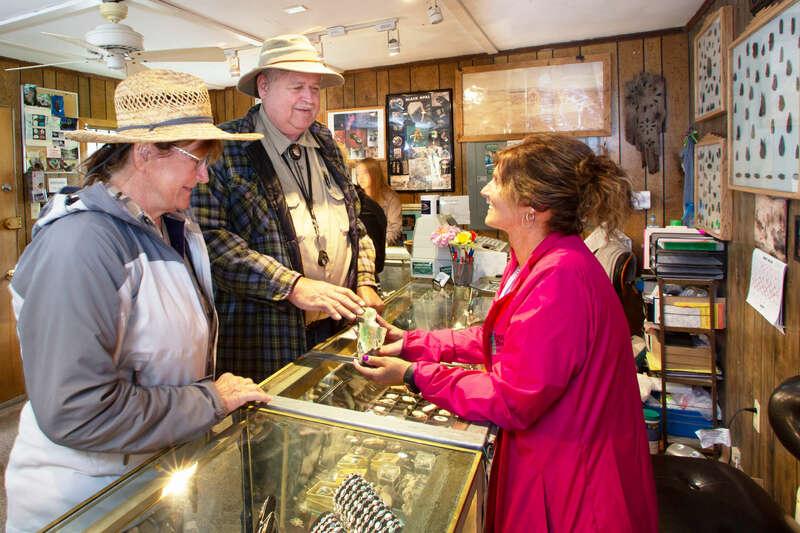 The Gift Shop is open daily, in season, from 7:30AM to 4:30PM. 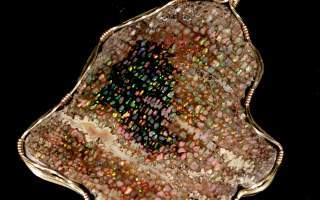 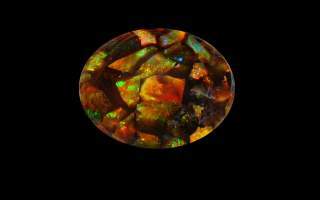 Moss opal is typically opaque, and lacking the vivid play of colors that characterizes precious opal. 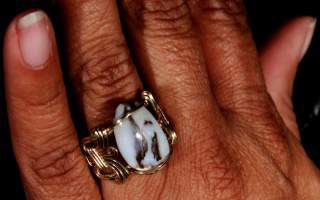 Its appeal comes from dark green, moss-like inclusions. 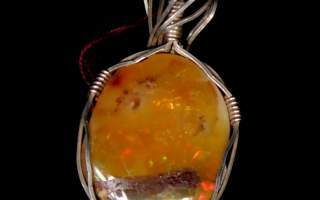 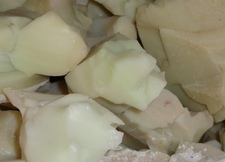 It is popular among jewelry makers, who use it in pendants, earrings, and pins. 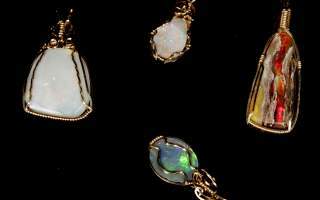 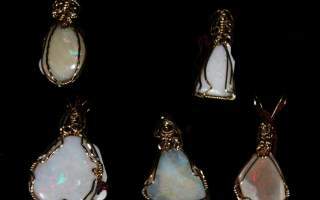 Opal is the birthstone of those born in October. 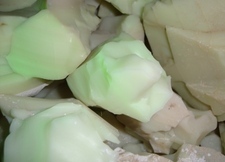 As its name suggests, fluorescent opal fluoresces green when viewed under black light. 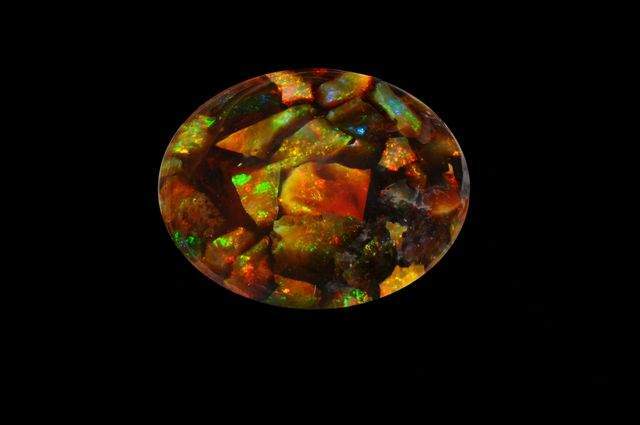 The Royal Peacock is the world's only known source of fluorescent opal. 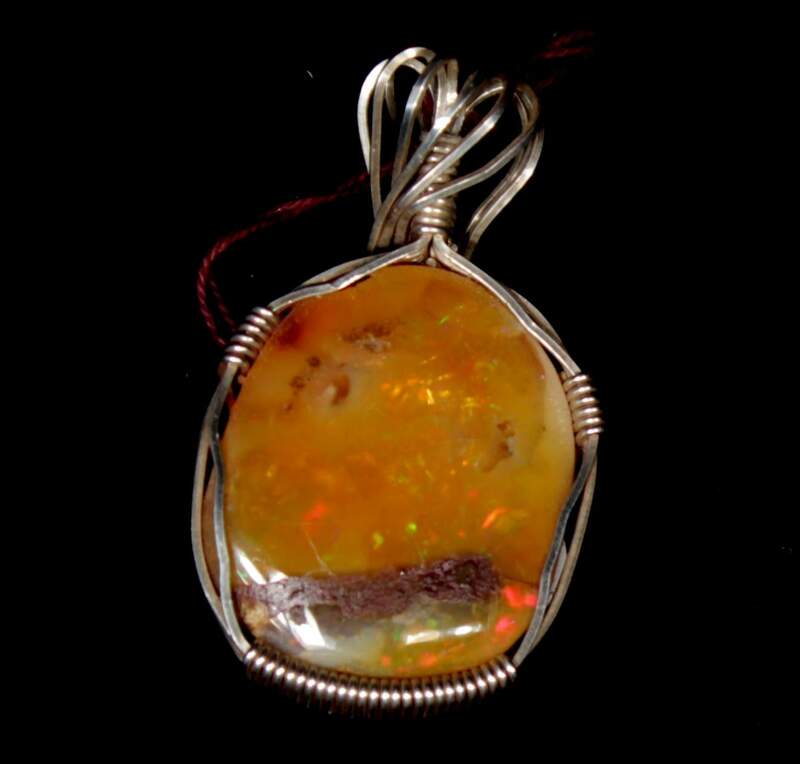 The gift shop specializes in spectacular wire-wrap jewelry. 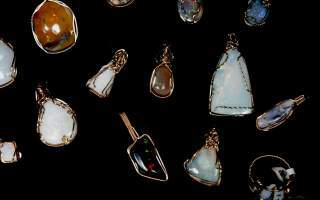 Some of it is made by Jake Anderson, a fourth-generation member of the Wilson family. NOTE: There is no cell phone service from the Mine. 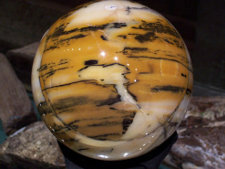 However, we do have a payphone, located outside the Gift Shop/Office.